While most people are out enjoying the warmer weather spring offers, there are some who cannot wait to make their way underground. 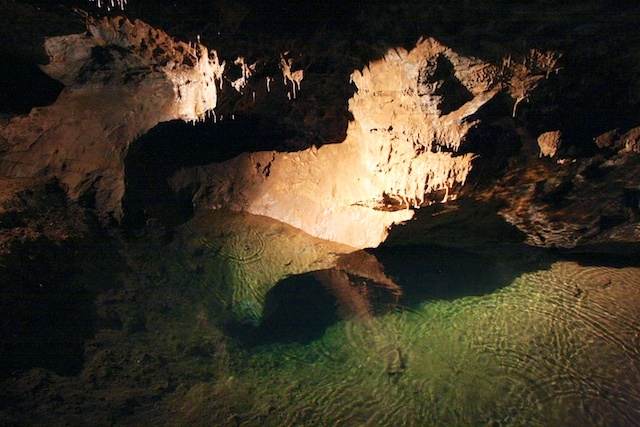 With the rainy season behind us, California Caverns are opening up for those who aren’t afraid of the dark. 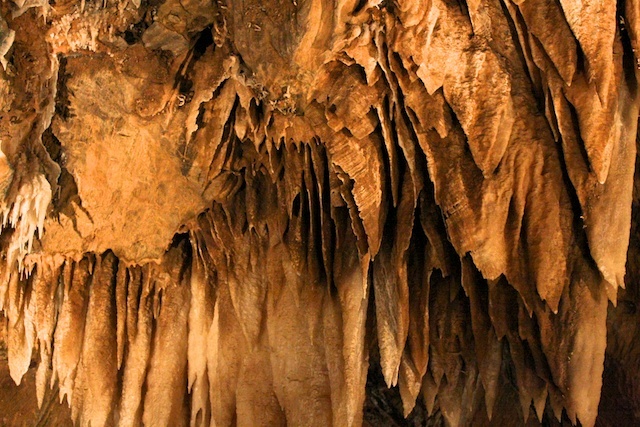 Tour guides interpret the eerie speleothems (cave formations), created by water droplets and mineral deposits. Most of the formations follow the laws of gravity. Stalactites appear to grow downward as water droplets following down the same path leave minerals behind. Stalagmites on the other hand, appear to grow upward, as water droplets fall and land in the same place depositing minerals over time. Helictite crystals, however, actually defy gravity. Although their formation is not fully understood, water pressure and capillary forces are said to play a key role. 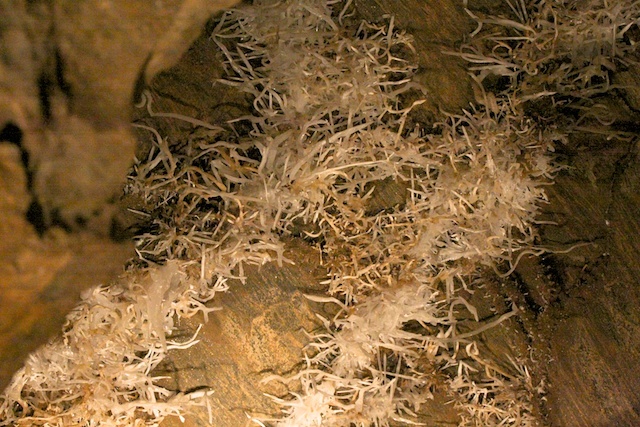 This results in one of the most delicate, extraterrestrial-looking speleothems. Simpler formation names inspired by more familiar objects include “soda straws,” “angel wings,” and “bacon.” Their formation is so slow, a speleothem that is a couple inches long can be several hundred years old. Although bats are an iconic cave inhabitant, you won’t find them here. Small crustaceans are one of the few residents confirmed living in this isolated environment. One species is endemic to Black Chasm Cavern, meaning, the entire population exists only in that cave. An environment that is so secluded means that the slightest disturbance can throw its ecosystem off balance. Algae has unnaturally began to grow in the caves because of the heat given off by light bulbs. When touring, it is important to observe the formations without touching them, as the oils from our skin can degrade the fragile speleothems. To help preserve these chambers, tour guides will immediately turn lights off when leaving, and in California Cavern, a pristine chamber called the “Jungle Room” is only shown to visitors who have demonstrated respect for the cave and its rules. 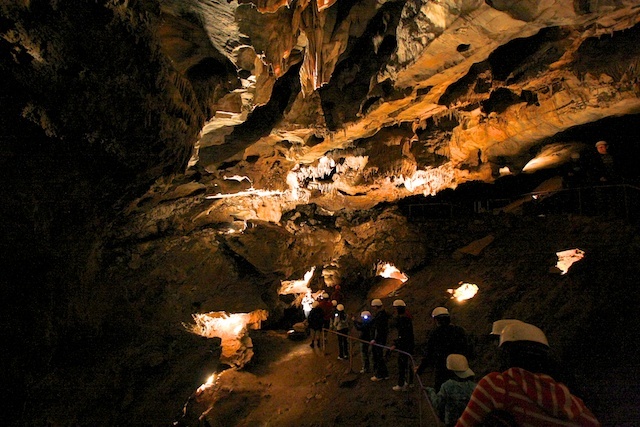 Located just 3 hours from San Francisco, exploring Black Chasm Cavern, California Cavern and Moaning Cavern is a fascinating way to spend the weekend for all ages.